Note: Shadows is the second book in the Ashes trilogy, and the summary below may contain spoilers. Goodreads Summary: The Apocalypse does not end. The Changed will grow in numbers. The Spared may not survive. Even before the EMPs brought down the world, Alex was on the run from the demons of her past and the monster living in her head. After the world was gone, she believed Rule could be a sanctuary for her and those she’d come to love. But she was wrong. Ashes was one of the first post-apocalyptic books that I read, and it set a very high standard. So much happened, and yet there were still so many questions that left me eager for Shadows. Shadows was darker and more intense than Ashes, and even though it is long the book was impossible to put down. 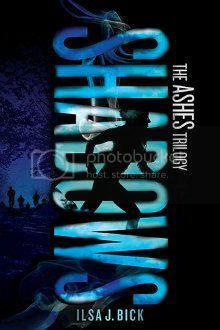 It's hard to say much about Shadows without spoiling Ashes or Shadows itself, but there are no shortage of things that happen throughout the book. Shadows traces parallels journeys of several different characters, and the point of view switches with every chapter. I enjoyed getting to know more about some of the characters from Ashes as well as the new ones introduced here. And because each chapter ends with a cliffhanger and every situation the characters face is fraught with instability, suspense and tensions are always high, and it's impossible to stop reading. Each of the narratives was equally compelling, and I want to know how everything comes together in the final book. Shadows certainly proves that it is a small world, and it was interesting to see how everything intersected. As I said before, Shadows is darker than Ashes, with some vivid descriptions of unpleasant things. Even though the descriptions are never gratuitous, it is something to know before reading. Also, throughout Shadows, it seems like things are always just out of reach - be it knowledge for the reader or opportunities or people sought after by the characters. I can't wait to see how everything plays out at the end of the trilogy. Shadows is an incredibly complex book and a great sequel to Ashes. I'm looking forward to the final installment of the trilogy! Thanks to the publisher, I have one finished copy of Shadows to give away! To enter, please fill out the form below. This contest will close on Friday, Nov. 2 at 12:01am CST. I'm glad you enjoyed it. I do prefer the darker side of YA so this sounds like a great follow up. I'm happy you enjoyed it! I've read Ashes and really liked it, though I remember having some issue with the end. I'm happy to hear that this lives up to the first one.